Back Off In #Haiku. 11/7/14. Change starts with the leaves. Leaves his name on truck year round. Why is his weight important? Was it a steak knife? But only for the wealthy. Poor right shot their feet. The worst since Al freakin’ Gore. 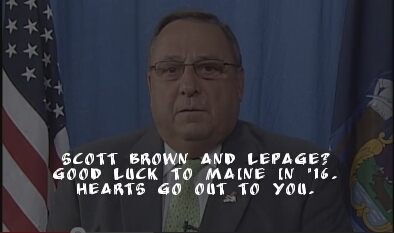 Good luck to Maine in ’16. Hearts go out to you. That’s what this election proved. Polls opened at 6 a.m.
Not a big fan of Big Gov. Take those damn signs down. No one wants to see Brown’s face. Part of why he lost. Folks don’t vote for signs. In fact we vote against them. This entry was posted in Uncategorized and tagged haiku, lepage, Maine, midterm, Obama, poetry, scott brown. Bookmark the permalink. ← Back Off in #Haiku. 11/6/14.